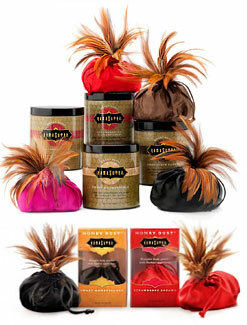 Enjoy Kama Sutras famous Honey Dust Body Powders. These sensuous, kissable powders are made with pure, natural honey, one of ancient Indias most prized skin conditioners. Dust it on yourself and your lover, leaving a silky-soft glow, a delicate fragrance and an irresistible taste. Includes, a satin pouch filled with fine powder, and a handmade feather applicator designed to tickle your lover's erogenous zones. The Kama Sutra Honey Dust is amazing. I wear it every day and have every flavor. It makes your skin feel soft, never sticky and you always smell and taste wonderful. Amazing product and something I get for my friends as gifts all the time.